MADISON, Wis. (AP) — With every win in what has been a rugged early-season schedule, No. 22 Wisconsin is proving that last year may have been just a fluke. The Badgers are back to their old, reliable ways – getting clutch stops and key contributions from different players. 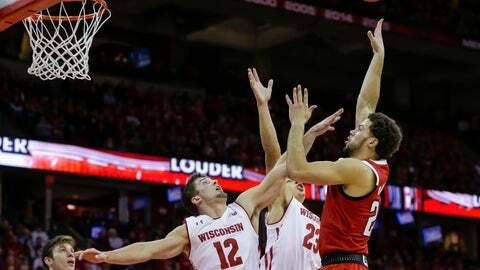 Ethan Happ had 19 points and 11 rebounds, D’Mitrik Trice hit a long jumper with 23.6 seconds left and Wisconsin withstood North Carolina State’s in-your-face defense to rally for a 79-75 win on Tuesday night. The Badgers finally broke through in the end, with Happ leading the way in the paint. It was a nice bounce-back win for Wisconsin after a grind-it-out loss last week to another ACC team, No. 4 Virginia. “It felt like a February conference game,” coach Kevin Keatts said about the intensity at the Kohl Center. Wisconsin got boosts from the 3-point line from Trice, who had 18 points and went 4 of 5 from behind the arc; and Aleem Ford who had 12 points on four 3s. They Badgers have already reached six wins before the end of the November. It took them until Dec. 23 to get to six in an injury-plagued 2017-18 season that ended without a trip to the NCAA Tournament. “I think that’s attributed to experience that we’ve gotten,” Happ said, “and playing team basketball and not relying on one or two options, having everyone able to contribute. N.C. State: The game had a choppy flow in the first half before opening up in the second. In between the whistles, the Wolfpack mostly dictated the pace with its man-to-man defense and occasional full-court pressures. Keatts’ team had feasted on lower-division opponents in getting off to a 6-0 start, though a close loss to the Badgers on the road proved that the Wolfpack were on the right track. Wisconsin: Happ had some decent looks in traffic around the basket but was just 3 of 11 from the field in the first half. The preseason All-American also found open shooters on the perimeter when he got doubled, but Brevin Pritzl and Ford missed a couple opportunities. Shooting improved in the second half, when the Badgers were 62 percent overall and 54 percent (6 of 11) from 3-point territory. Trice’s emergence early in the season as a clutch shooter has helped open up the offense. His long jumper with the shot clock winding down in the final minute dealt a blow to the Wolfpack. “I thought our guy was there … (Trice) backed up a little bit, he banged the shot,” Keatts said. Trice said Wisconsin knew that N.C. State would pressure full court. But the Badgers were able to get the game to a slower, more favorable tempo after stringing together defensive stops. “To face a team that’s stressed you for 94 feet … there was a lot of heart, toughness and grit,” Gard said. Torin Dorn had 14 points and 11 rebounds for the Wolfpack. … Davison finished with 12 points.